Evolving musically is a key element to succeeding in today’s scene. Bands who stand still too long find themselves pushed aside or forgotten as soon as their songs end. This has possibly been seen most evidently in the metalcore / deathcore scene, as bands are being forced to push boundaries from a style that for a solid 10 years saw little to no change. No longer can you just growl over breakdowns and call it a day. We are starting to see a lot of bands include singing to off tempo slow jams or even bringing in electronic elements. We started to see traces of this in Upon A Burning Body’s previous release, The World Is My Enemy Now. You got a sense the band wanted to break from the metalcore chains but didn’t want to stray too far from their base. Well here we are 2 years later and not only have the broken those chains but they have made an album that is genre defying and showcases the many talents that the band couldn’t showcase before. 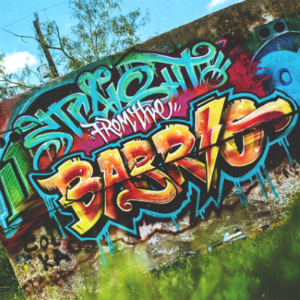 UABB’s first couple albums carried more of a party vibe with tracks like Intermission and Texas Blood Money, we saw that tone change with the last album showing a more serious side of the band. With Straight From The Barrio we have the band bringing a perfect blend of both with an extra little sprinkle of aggression over the top. Sure, you still have your beer chugging, tequila shooting anthems like ‘Til The Break Of Dawn, but overall this album carries a more personal message. That message for the most part being a giant f*ck you to all the haters and doubters of the band. It also offers a very personal introspective take on life from front man Danny Leal. It’s these more personal tracks that really stand out on this album, showing that even these rockstars in the spotlight go through the same issues in life as you and I. Being a long time follower of this band, I must say that Straight From The Barrio is the album a lot of us fans have been waiting for. Nothing against the previous release as it certainly had some incredible tracks on it. It just at times was missing that UABB feel and had a few tracks that never really caught my attention. Whereas Straight From The Barrio kicks things off like a boot to the face and doesn’t let up along the way. Even the “slower” songs are still UABB to the core and open up a whole new realm of possibilities for the band. Like it or not ladies and gentlemen, Upon A Burning Body are back and better than ever!